This rose is made in the ‘traditional’ way by adding individual petals to a wired Rose centre, Seed Pod & Calyx are added to the underside of the flower. The Leaves are cut out & wired and then the Rose & the Leaves are assembled into a spray. This spray is made up of gum paste sugar Roses in shades of pink, a Rose Bud, Rose Leaves, deep pink & white Blossoms & Hydrangeas in shades of pink and lilac. 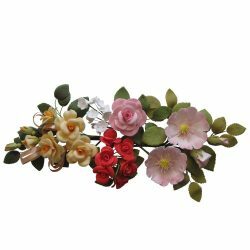 The flower spray is placed into a flower pick before it is inserted into a cake. 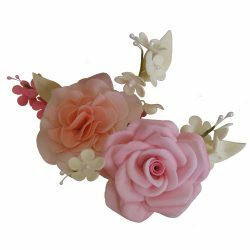 This crescent shaped spray is made up of gum paste sugar Roses, Rose Leaves, yellow Carnations & white Blossoms. It’s made by assembling two identical sprays for each end & one for the center, then joining them together to make one spray. 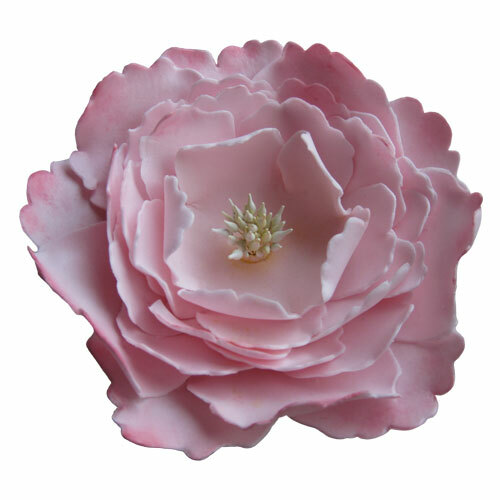 This gum paste sugar spray is made up of a large, pink Rose, a large variegated orange Carnation, pink & white Blossoms. Can be used on a small cake, a larger cake needing a few flowers or to supplement a larger arrangement of flowers. 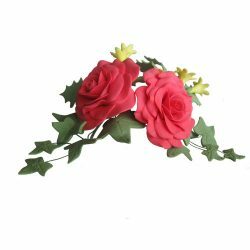 This gum paste sugar spray is made up red Roses, yellow Blossoms, Holly & Ivy Leaves. Because seasonal flowers are very limited in December (unless you live in a warmer climate) it is quite acceptable to use Roses on a Christmas Cake. 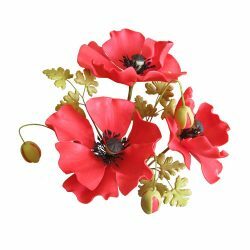 This arrangement is made up of 3 large Poppies, 3 Poppy Buds, & Leaves. The Poppies have large, unique, black centers & because the petals are large they are wired individually to give them support & to keep their shape. 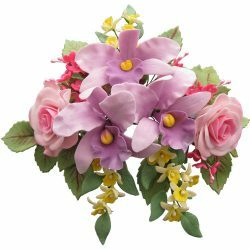 This arrangement is made up of shaded purple Cattleya Orchids, shaded pink Roses, yellow, miniature Cymbidium Orchids, deep pink Blossoms & Rose Leaves. The flowers are placed into a flower pick & inserted into the cake. 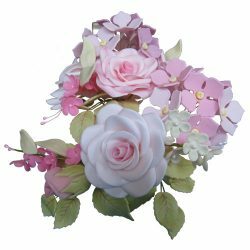 This gum paste sugar flower arrangement, that would be suitable for any type of celebration cake, is made up of a shaded pink Rose & Bud, a shaded orange Carnation, pink Hydrangeas, small, dark pink Blossoms, larger white Blossoms & Rose Leaves. This Peony takes patience to make, each layer of petals are added one at a time & dried before adding another layer. 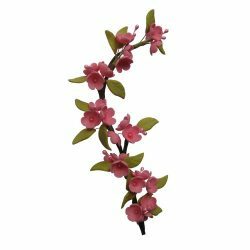 You can make all the petals at the same time & assemble them when dry, but they are more likely to break when made that way. This gum paste sugar arrangement is made up of three large, shaded, pink Roses and four Rose Leaf branches. Because of the size of the Roses, this spray is suitable for a cake without any other flowers added to it. 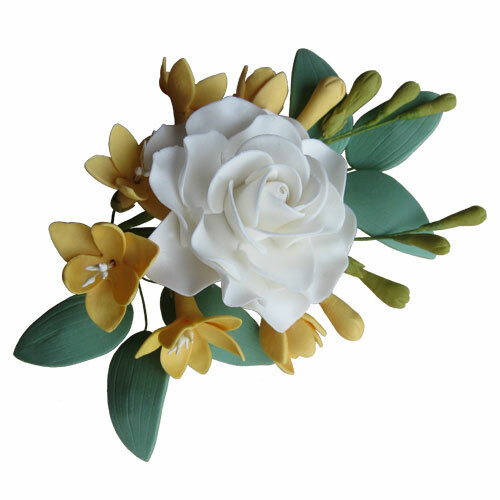 This gum paste sugar arrangement is made up of a white Gardenia and yellow Freesias. 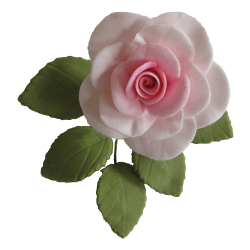 The Gardenia flower is usually pure white but occasionally you can find a cream one or a pale pink one. A sugar Gardenia is a very special flower. 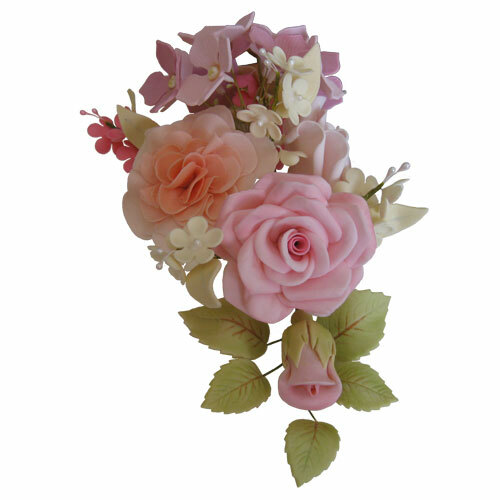 This gum paste sugar arrangement is made up of a pink Rose, four orange Roses, six red Roses & Rose Buds. There are also some white Blossoms, two pink wild Roses with Buds, Rose Leaves & ribbon picks. Gum paste sugar, white, pink & purple Anemones, and Leaves. 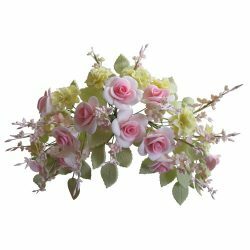 These flowers come in a huge variety of colours & can be single or double flowers & some even look similar to a multi-layered daisy. 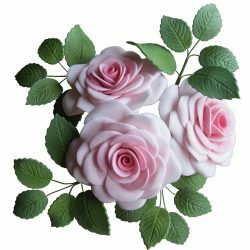 These are lovely flowers to make in sugar.